Today, I am writing about the mysterious case of the financial commentator who turned into a banana. It happened around 4.5 years ago and has left a disturbing trail of comedic predictions. The person in question still looks a little like he used to although he has clearly become a piece of fruit. Anyway, some further analysis will help us track down the culprit. In simple terms, the perpetrator is that familiar neo-liberal groupthink that we know so well. The commentator was so imbued with it that he turned into a banana. Read on, it is a terrifying tale. Here is a brainteaser to get things started. The following two images are provided to you as Exhibit A and B. 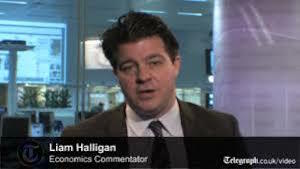 Your task is to identify which one is Liam Halligan, the UK Daily Telegraph finance commentator. If you chose Exhibit B then you should go to the top of the class. Even on his own reckoning, Halligan has turned into a banana. During that interview he claimed the combination of “a big budget deficit and the Bank of England’s quantitative easing policy” would cause inflation to get get worse. He also claimed that the bond market would see the higher deficit and eventually stop funding the government. This is a government that issues its own currency. The following graph (courtesy of the BBC) shows the evolution of the Consumer Price Index and the Retail Price Index in the UK since 2000. 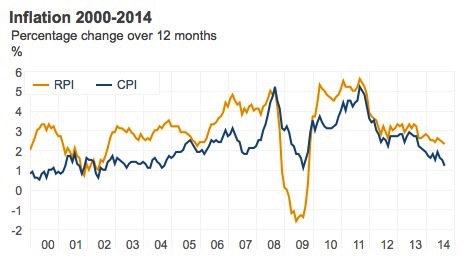 Britain is now heading towards very low inflation. The BBC Economy tracker: Inflation (last updated October 14, 2014) tells us how inflation in the UK is headed down and will probably be below 1 per cent per annum before too long. VAT went back up to 17.5% at the beginning of 2010, and was increased further to 20% the following year. Big rises in gas and electricity bills, along with transport costs and food prices, pushed prices up further. Since then, the rate of inflation has subsided as the impact of VAT rises and higher energy costs have fallen away. So a banana he is! And not a very bright one at that. Further, inflationary expectations barely moved in 2010. The following graph used the data from the Bank of England/GfK NOP Inflation Attitudes Survey and shows the median inflationary expectations in Britain (per cent rate per annum) 12 months ahead (blue line) and 5 years ahead (red line). Check out what people thought would happen to medium- to long-term inflation around the time the Banana was making his predictions. The curve is about as flat as you can get without being a straight line. Throughout the crisis he was making bold predictions like this. In this diatribe (August 19, 2012) – A message from the 1970s on state spending – after a generalisd rave about the UK government’s fiscal deficit which would become problematic “when inflation is soaring, as a currency plunges, after a nation has printed so much money that investors finally tire of debasement and cut that country loose” he actually admitted (unknowingly) that the UK government didn’t need to access private bond markets in order to spend anyway. Yields are low partly due to the eurozone mess, but mainly because the biggest purchaser of sovereign debt is the state itself in the form of the Bank of England. Circular financing can work for a while, but eventually the music must stop … The “safe haven” status of UK gilts, built on political bribery and group-think, simply can’t last forever. In the eye of the storm, the UK should be seriously cutting spending, getting ready for the un-wind, not using the temporary calm to justify another massive spending spree. Oh dear. The ‘safe haven’ status of public debt in the UK is intrinsic to the fact that it issues its own currency. The Bank of England could buy all the government’s debt or the government could change the rules to allow it to issue no debt – and all the time it would still be spending. The private bond markets are only empowered in national debt markets where the government issues its own currency, if the government plays the charade that they have to issue debt and that debt has to be issued on the terms set by the private bond dealers. Any informed person would know that a government that behaved in that way was not acting in the natinal interest but rather, providing a highly lucrative and specialised form of corporate welfare to the financial elites and top-end-of-town. ‘Growth versus austerity’, though, is a false and dangerous dichotomy. It is a misleading policy choice, as this column has often said, formulated and fed to electorates by opposition politicians and their pet intellectuals. “Economic growth” isn’t a choice that governments can make. It is, instead, a useful outcome that can be achieved in a variety of ways, none of which is guaranteed. Governments can always stimulate growth as defined by the national statisticians the world over. A good place to start would be for the government to use its currency issuing capacity to employ all the unemployed. The wage bill would add to growth immediately. 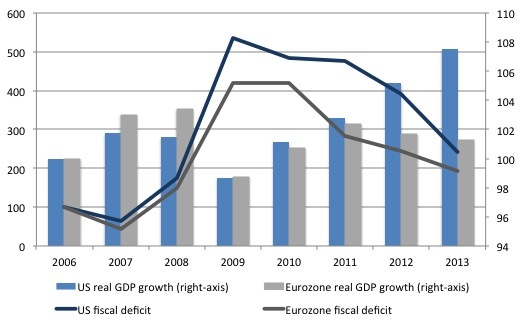 The following graph compares the evolution of fiscal deficits in the US and the Eurozone from 2006 to 2013 (indexed to 100 at 2006) and real GDP growth rates in the respective areas also indexed to 100 in 2006. The US held its elevated fiscal deficit for long enough to support a stronger return to growth whereas the austerity imposed in the Eurozone caused the initial return to growth to stall. By 2013, the Eurozone deficit was about the same as that in the US but the first was due to sluggish growth (a bad deficit) and the latter was due to stronger growth and improved tax revenue (a good deficit). But the point is that expansionary fiscal policy was spectacularly successful during the GFC just as the imposition of fiscal austerity was extremely damaging. But then what would a banana know about economics? So the Banana was masquerading again as Liam Halligan. The article in UK Telegraph (October 25, 2014) – It’s time to come clean about our national debt – is as the twitter alert indicates chock full of nonsense. The potassium levels must have been through the roof! After predicting that bond markets would go on strike several times in the past several years without any sign that they want to (or would), the Banana was claiming that the recent British “public sector borrowing figures … were truly shocking – so bad” that a major shift in economic policy is required. Regular readers will recall that I recently considered the data and concluded that the sustained fiscal deficits (and accompanying rise in public debt) were helping Britain sustain economic growth. A good thing if you are unemployed. Please read my blog – British economic growth shows that on-going deficits work – for more discussion on this point. The Banana once again stumbled into his own internal contradictions. Remember, you cannot have growth according to him via fiscal stimulus. The economy is growing at 0.7pc per quarter, we learnt on Friday, far faster than last year. Yet public sector net borrowing over the first half of 2014-15 was 10pc higher than the same period in 2013-14. Borrowing in September alone was £12bn, a staggering 15pc up on the same month the year before. While tax receipts were up 3.1pc, revenue growth was outstripped by even higher spending. For all the talk of “austerity”, central government expenditure in September was 5.4pc above that during the same month a year ago, as welfare payments spiralled. Yet the banana doesn’t seem to realise that these conjunction of outcomes (causal from fiscal position to economic growth) essentially deny much of his claims over the last several years about growth and austerity. He really is a very silly banana. … foisting our profligacy on our children and grandchildren – who will, even without the burden of our debts, face life in a much more competitive world. Of course, he doesn’t mention that the public spending is helping to ensure that children do not grow up in jobless households and inherit all the disadvantage that comes with that. And helping to create investment in productive infrastructure which will last for several generations. He also doesn’t seem to get that the children won’t be paying back anything. In actual fact, trying to “pay the debt back” requires surpluses which undermine growth and impose excessive tax burdens on the non-government sector. 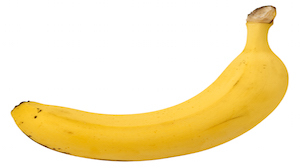 The Banana moves towards the end of his article exhibiting anxieties that need treatment. Is there a sedative for bananas – anyone out there who can help please E-mail him. … could ultimately spark another systemic meltdown, not least because such a high share of UK government debt is now owned by foreign creditors. I love the use of could in all these doomsayer predictions. At least, the Banana is being more circumspect than when he predicted he was a banana. Could – might – perhaps – means just enough to frighten and give the impression he knows more than nothing but not enough to nail down anything concrete that will come back to haunt him. The Banana shouldn’t have bothered – there are enough false predictions in his past writing to let anyone who knows anything to realise he isn’t very accurate at all. What exactly are the foreign creditors going to do? Stop buying bonds? Sell them and make losses? If they stop buying them then the Bank of England can always step in. As a result of quantitative easing, around a third of the UK’s gilt stock is owned by the Bank of England. That’s right, 32pc of our government bonds have been bought by our central bank, using virtually printed money. That’s helped to rig the market, keeping interest rates artificially low. That’s it! The foreigners can act irrationally if they like and surrender the corporate welfare. Then the BoE just fills the breach until the British government works out it can stop issuing debt altogether. And if you think this is just the ravings of the right-wing set, think again. Last week (October 22, 2014) the so-called progressive UK newspaper The Independent published an editorial – The missing wealth: Despite economic growth, public finances are still a mess. In making the object of the article the state of the “public finances” and referring to a rising deficit and public debt as “a mess” that needs to be fixed, the editorial buys into the neo-liberal myths that the likes of Halligan push out in their own journalism. The Independent noted that the source of their ‘problem’ was that too many very low wage jobs are being created in the UK as part of their so-called recovery, which is undermining the capacity of the national government to generate tax revenue. A progressive analysis would say that the low-wage economy model is the problem rather than focusing on the impact that problem has on the relatively meaningless public fiscal balances and related financial artefacts (debt ratios etc). None of the main parties are being honest with voters about the need to raise taxes and deepen cuts after the 2015 general election. The Institute of Public Policy Research (IPPR) claims it “is the UK’s leading progressive thinktank”. God (substitute preferred abstract hope) help us! Note the use of the word need. On what basis is there a need given that growth is not assured and given that the labour market is a long way from being recovered? The IPPR’s reasoning, mindlessly reiterated by The Independent is that the need is evident by the rising public deficit. Since when are these financial ratios a legitimate target for progressive policy making? Answer: since they all turned neo-liberal – just like Halligan. The Independent might stand tall on its image as being the media outlet for the educated and sophisticates, whereas The Daily Telegraph is for the hoi polloi, but in essence, the message and the way they frame the message is virtually identical. Reasoned discussion gives way to hysteria and myths. The only question that remains unanswered if Halligan is so wrong then how do we know he actually became a banana? And to bill40 (the tweeter) – I am not skilled enough to write a spoof of this quality! Only the Banana and his ilk can come up with that sense of comedy. When you have progressive commentators falling back on calling the EU a ‘nobel endeavour’ and that the Euro has provided ‘breathing space’ then you know that they are caught up in the rapture of an abstract ideal rather than the reality on the ground. The EU is a catastrophic failure, completely captured by corporate interests, that is about to sign up to the TTIP which will enshrine the superiority of corporations over national governments into the heart of the legal structure of the operation. The ideal is indeed a noble one, but that isn’t what is in place, nor is it likely to be at any point in the foreseeable future. 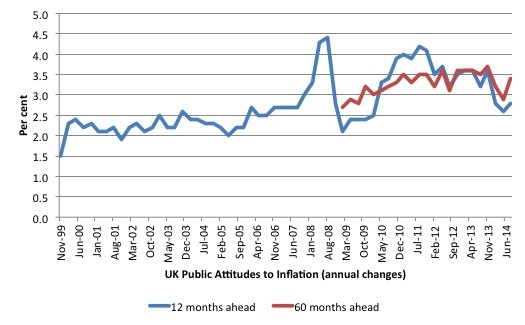 I did not think UK RPI was lower than CPI over the last 7 years as shown in the BBC graph. Suppose that we have 2 neighbors, a man and a woman, who are always quarreling. Finally they come to the conclusion that it is better to live in peace. To insure that their peace will last, they decide to get married. Is that a good idea? I don’t think so because the mere fact that people are married doesn’t insure that they will live in harmony, and marriage itself provides many opportunities for conflict. When the French and Germans decided to create the forerunner of the EU after WWII, they behaved exactly as my 2 hypothetical neighbors. Bill – you are using a CB canard (inflation indexes) to defend a falsehood. For the guy on the top of the heap with a huge stock of tokens this of course appears as a deflation – but it is not. Giving a person a pointless job will add to real costs so will not solve the problem. The problem is of course the corporate nature of governance which attracts huge amounts of rentier flows upwards into dead zones. Any increase in fiscal debt adds to wealth concentration (a small amount of people and institutions holding a huge stock of debt money) and thus causes the instability we see today. The only solution is of course to add a clause free debt free income to citizens while outlawing hyper inflationary bank credit creation. The objective should be to effectively destroy the top down system of production and demand management. People will then no longer have to visit that discount store with absurdly long supply chains. Exchange will again become localized as people generally prefer to engage in communal activity if they can afford to do so. Real leakage of wealth will decrease. This mean no more wealth dead zones. Then it will be time to get on with the business of living. “The Debate: Is there an inflation bubble? I can’t help but think that Halligan is merely pandering to his audience – the Telegraph is read by (and aimed at) an elderly, white, southern (of England) and socially conservative audience who are generally ignorant of economics but genuinely believe that debt, immigrants and anything to do with Europe is bad. Recent decades of consuming find me delighted with the ‘cargo cult’ availability of anything imagined, or unimagined. eBay is some magic shop where you search for a whim and find it for $2 shipped free. Local businesses and producers go out of business. Cheap global shopping erodes local community ability to sustain itself. Buying local was not only an imperative, but a survival strategy long forgotten. When the (absurdly long) supply chains falter, do we starve? What do the Americans say again. The Dork is Sacked !!!! Wonderful stuff and so true but my football point remains in the air for the moment. The production distribution and consumption chain remains broken. That is the only important point. Jiving about inflation or deflation metrics misses the point of what is happening or not happening in the real economy. This preservation of this stock of debt is doing nothing for me man. It is obviously leading to further entropy in the economy. I cannot see how you can deny this even if one is but a Dork or professor of this and that. Giving me a job will not solve the concentration problem – it will merely make it worse. The banks always reach this fork in the road and they always choose to kill people rather then share. I’m really enjoying discovering this blog. A lot of economic commentary can be quite dry and a statistics dump. I had a good laugh here. This Liam Halligan guy sounds like he’d be more at home on the moon rather than a UK newspaper. You almost get the feeling that they can’t be THAT stupid. Its almost like they’re pushing this nonsense for another end – might it be cutting welfare, health, pensions and other benefits for the non-aristocrats? Hmmm. It makes you think.